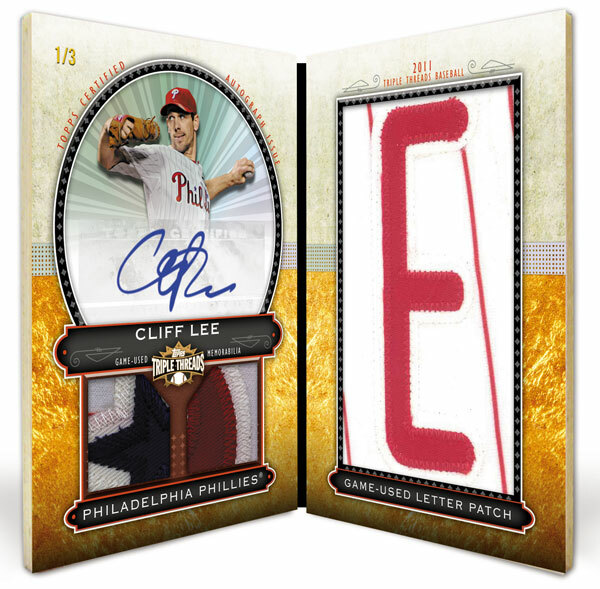 2011 Topps Triple Threads returns for another season of high-end baseball card hijinks, this time packing double the hits per box and several intriguing new additions including Unity Relics, in which collectors are asked to complete a "Triple Thread" on their own. 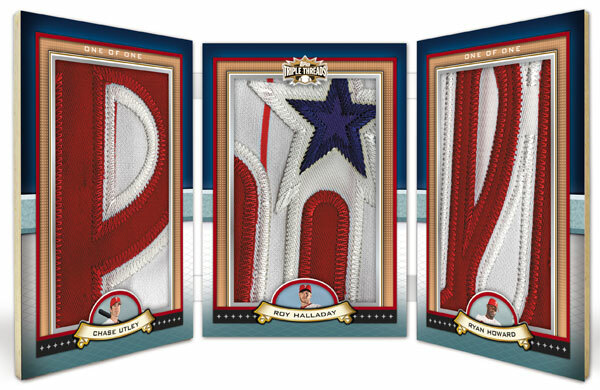 2011 Topps Triple Threads Baseball is set to release in late July, with each 2-pack box delivering 4-hits. 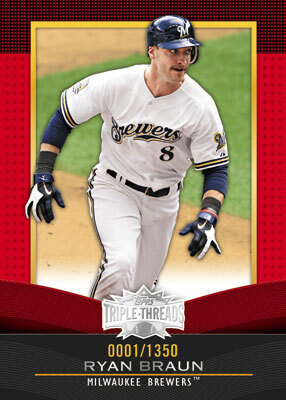 Double this hits - Two hits per pack, which is twice as many as in the past! 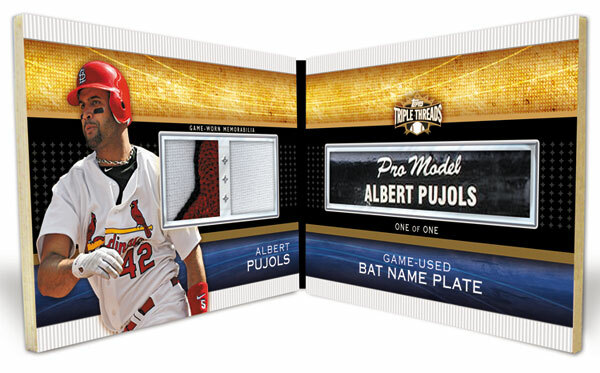 Each pack delivers an autographed relic, an additional relic and 3 base cards (includes 2 parallels). Each box will include 1 single Unity Relic, 1 Autographed Unity Relic, 1 Autographed Triple Relic and 1 Triple Relic. NEW Unity Relics - background images for a group of players are shared and join together to form one larger image (1 per pack)! Each unity relic contains one piece, giving collectors the added incentive to complete the "Triple Thread". Unity Relic Checklist features 243 players with a total of 27 different backgrounds. NEW Flashback Relic Cards - which feature pictures of legendary player as a rookie and at the end of their career. Hank Aaron, Mickey Mantle, Babe Ruth, Nolan Ryan, Jackie Robinson, Lou Gehrig, Roger Maris, Stan Musial, Reggie Jackson, Ty Cobb, Sandy Koufax are among the 30 playes on the checklist of Topps refers to as "double-fronted" cards. Each 18-box case guarantees: one 1/1 autographed triple relic and 1 triple autograph relic card. Rookies and Future Phenoms Pairs booklet cards (autographed triple relic on each panel) and triple autographed relics. 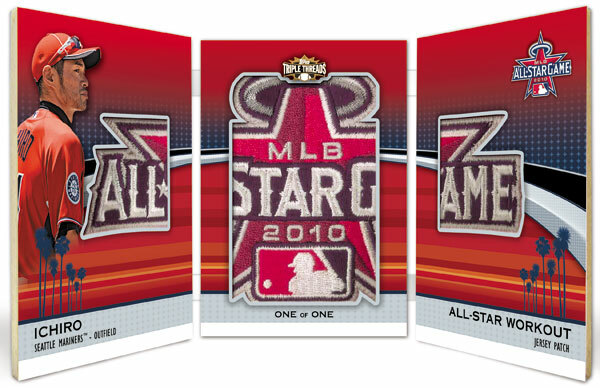 Subsets: Bat Knob Booklets, Bat Nameplate Booklets, All-Star tag and patch booklets and more! Standard autographed triple Relic checklist includes more than 90 players with a signature and three memorabilia swatches. Notable youngsters on the autograph checklist: Buster Posey, Mike Stanton, Jason Heyward, Freddie Freeman, Jeremy Hellickson, Pedro Alvarez, Jay Bruce, Starlin Castro and Aroldis Chapman. Notable old timers and veterans on the autograph checklist: Joe Mauer, Rickey Henderson, Alex Rodriguez, Frank Thomas, Juan Marichal, Stan Musial, Roberto Alomar, Joe Morgan, Frank Robinson, Eddie Murray, the late Duke Snider, Cal Ripken Jr., John Smoltz, Carlton Fisk, Nolan Ryan, Larry Walker, Ozzie Smith, Reggie Jackson, Johnny Bench, Tom Seaver, Ryne Sandberg, Ryan Howard, Willie McCovey, Mike Schmidt and Albert Pujols. Early groupings include: Aaron-Koufax, Aaron-Heyward, Bench-Mauer-Posey, Schmidt-Rodriguez-Longoria, Ryan-Halladay-Hernandez and Sandberg-Dawson-Castro. 2011 Topps Triple Threads Factory Sealed Football Hobby Box Cam Newton AUTO RC? 2011 Topps Triple Threads Football HOBBY Box Cam Newton RC Auto Jersey Booklet? Looks amazing! can’t wait to get my hands on some of that! WOW this product is amazing I’ve seen very few boxes that don’t have their moneys’ worth. I highly recommend buying one of these boxes. GREAT PRODUCT!! !